Wouldn’t it be a waste to go on a spectacular, exotic vacation abroad and just hang out at the hotel pool? Wouldn’t it be a waste to buy a new iPod, download four favorite songs, and play them over and over? Complete with an index that lets you find what you want, fast. 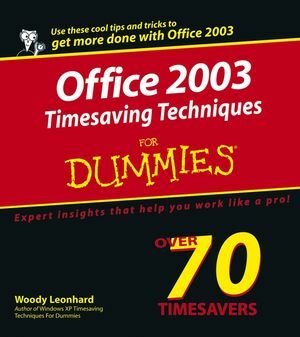 Office 2003 Timesaving Techniques For Dummies helps you get up to speed and down to work. After all, times a-wastin! Woody Leonhard is a bestselling technology author and a true Windows and Office guru. He publishes several e-zines on these topics for over 510,000 weekly subscribers. Part I: Knocking Office Into Shape. Technique 1: Making Windows Safe for Office. Technique 2: Launching Office Quickly. Technique 3: Organizing My Documents for Speed. Technique 4: Drilling Down with the My Places Bar. Technique 5: Backing Up Quickly and Effectively. Technique 6: Keeping Office Up-to-Date. Technique 7: Disabling Automatic Hyperlinks. Technique 8: Digging with Research —Quickly. Technique 9: Copying and Pasting in a Nonce. Technique 10: Keying Combinations Quickly. Part II: Saving Time with Word. Technique 15: Getting Word Settings Right. Technique 16: Changing Your Normal Template. Technique 17: Laying Out a Page — Quickly. Technique 18: Making Professional Labels. Technique 19: Editing Like a Pro. Technique 20: Finding and Replacing in the Wild. Technique 22: Fast Links inside Documents. Technique 23: Setting Up Your Own Letterhead. Technique 24: Positioning Pictures Just Right. Technique 25: Typing Fractions Fast. Technique 26: Getting Outlook Settings Right. Technique 27: Searching with Folders. Technique 28: Organizing with Flags. Technique 29: Taming AutoComplete in Outlook. Technique 30: Dealing with Spam. Technique 32: Working with E-mail Attachments. Technique 33: Securing Your Mail. Technique 34: Getting Excel Settings Right. Technique 35: Building Self-Verifying Spreadsheets. Technique 36: Freezing Columns and Rows. Technique 37: Ripping through Lists. Technique 39: Creating Custom AutoFill Series. Technique 40: Grabbing the Best with Pivot Tables. Technique 41: Creating Pivot Charts That Work Right. Technique 42: Setting Scenarios and Seeking Goals. Technique 43: Using the Lookup Wizard. Technique 44: Getting PowerPoint Settings Right. Technique 45: Choosing the Right PowerPoint File Type. Technique 46: Changing Your Blank Presentation. Technique 47: Recording a Sound Track. Technique 48: Making a Presentation Run Itself. Technique 49: Answering Predictable Questions. Technique 50: Building toward a Goal. Technique 51: Tripping the Light Fantastic with Multimedia. Technique 52: Taking a Presentation on the Road. Technique 53: Getting Access Settings Right. Technique 54: Adding a Cover Sheet to an Access Report. Technique 55: Including Totals in an Access Report. Technique 56: Printing Labels in Access. Technique 57: Reducing Repetitive Formatting Tasks. Technique 58: Recycling Forms for Browsing and Data Entry. Technique 59: Creating Your Own AutoFormat. Part VII: Combining the Applications. Technique 60: Inserting a Spreadsheet in a Document. Technique 61: Managing an Electronic Newsletter. Technique 62: Turning a Word Document Into a Presentation. Technique 63: Animating a Chart in PowerPoint. Technique 64: Rotating Text in a Word Document. Part VIII: The Scary (Or Fun!) Stuff. Technique 65: Taking Over Word’s Show/Hide. Technique 66: Inserting Unformatted Text in Word. Technique 67: Inserting Unformatted Text in Excel. Technique 68: Printing a Bunch of Spreadsheets — Fast. Technique 69: Protecting Your Privacy. Technique 70: Printing Personalized Greetings in Batches. Technique 71: Creating Versatile Watermarks. Technique 72: Building (And Stealing) E-mail Stationery.